US, 1945, 97 minutes, Black and white. Walter Huston, Barry Fitzgerald, Louis Hayward, June Duprez, Roland Young, Richard Haydn, C. Aubrey Smith, Judith Anderson, Queenie Leonard, Mischa Auer. 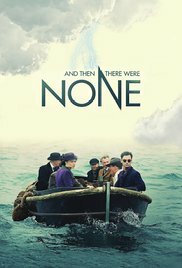 And Then There Were None is considered the classic version of Agatha Christie's novel and play, Ten Little Niggers. It was directed by celebrated French director Rene Clair, during his period in the United States during the war. He has assembled a very fine character cast, popular from the '30s and '40s, and made them the victims and suspects. Barry Fitzgerald, in the year after he made Going My Way and won an Oscar for it, is deceptive as the murderer. Walter Huston who was soon to win an Oscar for The Treasure Of The Sierra Madre, is very good as the alcoholic doctor. There are interesting supporting roles by Roland Young, Sir C. Aubrey Smith and Judith Anderson. The film stays very close to the play. However, the play romanticised the novel and gave it a happy ending. The novel is very chilling in its description of the last death from the leading lady, struck by conscience, she hangs herself. Subsequent versions of the play were made: Ten Little Indians, 1965, directed by George Pollock who made the four Miss Marple films with Margaret Rutherford. It had a celebrity cast of the '60s. There was a version in the '70s, directed by Peter Collinson who made many adventure thriller films including a remake of The Spiral Staircase with Jacqueline Bisset. Oliver Reed and Elke Sommer were the leads with Richard Attenborough in the murderer's role. There has been an interest in Agatha Christie in the '70s with the popular versions of Murder On The Orient Express and Death On The Nile as well as Angela Lansbury's casting in the Miss Marple films. 1. Audience interest in Agatha Christie’s work, its classic status, its tantalising the audience with suspects, entertaining with a murder mystery, an ingenious solution? How interesting an adaptation of the novel, play? Keeping the audience guessing, supplying clues? 2. The value of murder mysteries for entertainment ? the puzzle, the mystery, the solving? Dangers? Appearances and reality for the characters, motives? How well was this illustrated here? The conventions of the mystery, the mysterious island, the isolation from the mainland, the group of characters isolated in the house, the house and its trapping people. its not being a sinister house and therefore emphasising the sinister characters? The tricks, red herrings? 3. Black and white photography, special effects, the suggestion by images of what was happening, e.g. the cat, the ball of wool, the billiard balls, knives? The very moderate presentation of violence, suggestion rather than close-up? The use of the house, the exteriors? Storm? Light and shadow? The use of the song and the verses about the Indian boys? The reprise of the music during the film? Vera's innocence? The judge and his knowledge of the characters, of their motivation, of how they would react in situations? The suspension of disbelief for the murder mystery? 5. The grouping together if the characters - the arrival on the boat and the close ups indicating their personalities and style? Their reaction to being alone on the island, the information about their employer and host? The gradual interaction of the guests? Liking, suspicion, working together to solve the mystery? Fear? Confrontations? How did the film build suspense with the interaction and the gradual elimination of the characters and the missing Indian boy? 6. The focus on the judge, Barry Fitzgerald and his benign appearance, his explanation of himself, his making many of the statements, explicitly and thus diverting attention from himself? The plausibility of his motivation, his boasting at the end, his death? His exploitation of the doctor? 7. The doctor and his stupidity especially in trusting the judge? His fears, earnestness, drinking and pretence, his crime and punishment? The scenes of his collusion with the judge? The general and his memories, his premonitions of death, his reactions to Vera, his execution? Blore and the detective agency, his reason for being there, his suspicions of Lombard, his taking charge, detection, deductions? His being one of the last to die? The justice in his death? 8. The minor characters, the Rogers, Mrs Rogers and her fears, Rogers and his staying against the tide of opinion, his being insulted, under suspicion, the key and his drinking, his death? Miss Brandt and Judith Anderson's presence and style? Audience suspicion of her, her being alone, the knitting, the seaweed. her death? The prince and his callousness. his singing the song, his discussion of his crime, his immediate death? 9. The nursery rhyme and its implications, its use throughout the film, the disappearing statues, the indication of modes of death and the implements and suggestion? 10. The special effects for the deaths? The use of suggestion rather than explicit violence? Atmosphere? 11. The build-up to Vera and Philip being the only ones alive? Suspicions of one another, their explanation of their crimes and their innocence? mistaken identity? The feigning of the death? The trapping of the judge and survival? A romantic ending? 12. Themes of justice, the manipulation of justice, punishment for crime? The nature of the crimes committed and the callous disregard of the victims? Did they merit their deaths? The values presupposed in response to the murder mystery?